This Federal era structure shares many decorative features with the Gardner-Pingree Home. During the early 19th century, between 8 and 12 percent of the nation's revenues were collected in this building. See also: the Hawthorne in Salem Website, and the Salem Maritime National Historic Site. The Crowninshield-Bentley house was built for Captain John Crowninshield, and four generations of that family lived in the home until the 1830s. It is also named for Reverend William Bentley, who boarded there from 1791 to 1819, and who wrote a remarkably detailed diary that commented on people and daily events in Salem. The style of the home is known as “Georgian” for the 4 British kings in power with that name. Common structural features include symmetry and classical ornament. In this case, there are Greek “key” decorations above the windows, and flattened columns on either side of the doorways, called “pilasters.” Pilasters do not bear weight; rather, they are added to enhance the façade (main side of the building) and to suggest classical style and values. This Federal-period home was designed by Samuel McIntire (1757-1811) for John Gardner (1771-1847), who made his fortune in maritime trade (particularly the pepper trade) with the opening of new markets after the close of the Revolutionary War. Born in Salem, MA, Samuel McIntire began his career as a woodcarver and eventually turned to building homes for the wealthy elite of Salem. It was during the Federal era in the U.S. that builders first consistently created domestic architecture that was fully conceived and executed when erected. Previously, it was typical to build a room or set of rooms with the expectation that the house would grow with the family’s needs and means. McIntire designed both the exterior and interior of homes, and adorned rooms with carved swags, rosettes, garlands, and sheaves of wheat. The exterior ornament on the façade is largely focused on the portico, or entry porch, which features columns, pilasters (flat columns), and a decorative fanlight over the door. Salem Maritime National Historic Site, National Park Service. The Friendship was built in 1796-97 in Salem by shipbuilding Enos Briggs for Jerathmiel Peirce and Aaron Waite as a merchant ship in trade with the Far East. The ship voyaged to such destinations as China, Sumatra, Russia, India, and Italy. On its fifteenth voyage, the Friendship traveled to Archangel, Russia, and was captured by the British on the return. The captain and crew were taken as prisoners of war, and the ship was sold at public auction in London. This model was one of the sources used to recreate the full-scale vessel located at the Salem Maritime National Historic Site, National Park Service. The site offers educational visits to the Friendship and their website provides additional information. "For much of the 17th century, Amsterdam was the center of European cartography with Blaeu's firm as its dominant enterprise. When he first published Theatrum in 1635, it was recognized as the finest atlas of its time. The decorative images ornamenting his maps provide fascinating insights into European perceptions of cultures encountered throughout the world." Quoted from Peabody Essex Musuem's ARTscape. In the years following the Revolutionary War, many of Salem’s merchants grew wealthy through the China and East Indies trade. 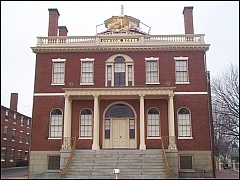 Tax revenues collected in Salem’s ports substantially supported the federal government at a time when it had many debts from the Revolutionary War. The wharf seen here in a painting by George Ropes was built by George Crowninshield and Sons. Several ships that they owned are also included: the America, Fame, Prudent and Belisarius. Gift of Wayne Patt Inc. This certificate was designed by Abijiah Northey, Jr. in 1797 and is one of the earliest depictions of Salem Harbor. Three industries represented here – shipbuilding, fishing, and trading – were primary sources of income driving Salem’s economy. Though fairly shallow, the natural geographic features of Salem’s Harbor proved an ideal location for wharves where fishing and merchant vessels moored. This image depicts the Derby Wharf area during Salem’s “Golden Age.” In the years following the American Revolution, Salem maritime entrepreneurs commenced trade with the Far East, selling spices, silk, tea, and other luxury goods for high prices. Social and charitable associations such as the Salem Marine Society (founded in 1766, and one of the oldest in the country) formed to aid the families of members in case of their illness or death. Philip Little (1857-1942) was born in Swampscott, MA, and entered the Massachusetts Institute of Technology, expecting to work for his father’s cotton and wool business. Instead, he found himself drawn to design and studied at both the Lowell School of Design and later Boston’s Museum School (now the School of the Museum of Fine Arts). Much of Little's work is inspired by the land, sea, and history of Salem and New England. In this work, Little portrays Derby Wharf, named for Elias Hasket Derby, who was one of America’s first millionaires during Salem's "Great Age of Sail." This work was executed about 100 years after Derby's death and the decline of maritime trade in Salem. Yet, Little includes a wind-powered vessel, juxtaposing past and present. His choice of the word “relic” in the title is telling; Little understands the power of Salem’s past, but he also acknowledges that like any important token of history, the wharf (and perhaps, Salem) does not hold the power, prestige and importance that it once commanded when Elias Hasket Derby lived. “Derby Wharf Area & Surroundings,” taken from G.M. Hopkins, Atlas, City of Salem, Plates 10 and 11. Additions by C.W. Snell, based on photographs. Traced by H.R.G. 15 November 1937. Salem Martime National Historic Site, National Park Service. A Plan of the Estate, Late Elias H. Derby-Esquire – On the South Side of Derby Street, Gideon Foster surveyor, additions by C.S. Snell, Map No. 2; 25 February 1805. Salem Maritime National Historical Site, National Park Service. The Salem Maritime National Historic Site, National Park Service was the first Salem pepper-trade specific boat. Its name refers to the term used for men who presided over the harbors and who negotiated trade in the Sumatra. Invoice discusses captain’s decisions in carrying and negotiating pepper cargo and deceptions to thwart possible pirate attacks. Letter to captain of Rajah from owners, with instructions on trade and voyage. When in October of 1799 a ship called the Rajah, owned by a small group of Salem merchants and captained by Jonathan Carnes, sailed into the port, she certainly did not introduce pepper to Salem. As residents of the second largest seaport in the United States, wealthy Salemites were already well accustomed to the taste of pepper. Of course, it was only the wealthy who could afford such a luxury, since pepper always arrived in small batches from the Sumatran coast. The Rajah made a stir in town, not because of the novelty of the pepper, but for its quantity. She was the first ship to return to the United States from Sumatra with a full cargo of pepper. Despite predictions of heavy losses to her owners due to a glutted market, the Rajah’s pepper sold for a seven hundred percent profit. Lincoln, Levi R. and Samuel Eveleth. Tariff: On Rates of Duties, Payable from and After the 3d of March, 1833…. Boston: Samuel Condon, 1832. Salem Maritime National Historic Site, National Park Service. Snell, Charles W. Historic Structure Report Derby Wharf and Warehouses Together with Data on the Physical History of the Ezekiel Hersey Derby and John Prince Wharf Lots, Lots A and B, Historical Data. [Selections] Salem Maritime National Historic Site, National Park Service. “Trade Goods in Public Stores Exhibit” Salem Maritime, National Park Service, 1 July 2004. Salem Maritime National Historic Site, National Park Service. The Salem Maritime National Park Service researched representative cargo and relative amounts of types of cargo that would have been stored at the Custom House warehouse. This list represents those goods. Chinese Coin and Prosperity Symbol in Chinese Porcelains: Chinese Dining Scene from Tingqua: Paintings from his Studio, Hong Kong Museum of Art, 1976: 25. Lui Hai with his string of coins from Eberhard, Wolfram, A Dictionary of Chinese Symbols: Hidden Symbols in Chinese Life and Thought, Routledge, London, 1986: 166. The Chinese coin symbol, a lozenge shape within a square, appears in both of these images. It can be broadly interpreted as a symbol of good fortune, or more specifically, a wish for prosperity. This symbol was also used in many homes in Salem (see the Andrew Safford house lights, on this page). *Thank you to Elizabeth Casler, 2005 SIH summer intern for her research and contributions to this topic.